While tales of giants abound and verifiable accounts are rare, female green anacondas are known to occasionally reach or exceed 20 feet in length and approach 400 pounds in weight. Male green anacondas and yellow anacondas are smaller than female greens, but still attain 10 feet or more. Unsurprisingly, the immense size of these snakes makes them difficult and potentially dangerous to house. Alongside the pythons and boas, anacondas are members of the family Boidae. The four described species of anaconda all inhabit South America. Green anacondas (Eunectes murinus) are the largest species and are found in the Amazon basin as well as the seasonally flooded Venezuelan llanos. Yellow anacondas (E. notaeus) are smaller than green anacondas, reaching about 10 feet in length. Found to the south of the range of the green anaconda, yellow anacondas are very similar to the Bolivian anaconda (Eunectes beniensis) that lives in Bolivia and probably neighboring Brazil. 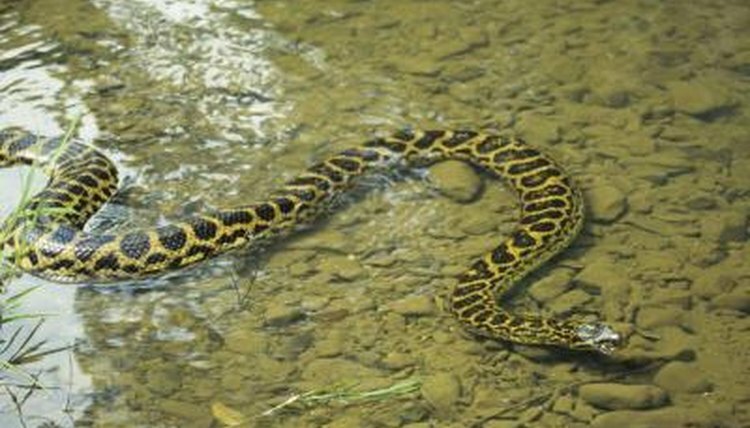 The dark spotted anaconda (E. deschaueneei) lives in the savannas southeast of the Amazon rainforest. Only green and yellow anacondas are available in the pet trade. As with all large constrictors, the cage must be secure, strong and durable. Additionally, considering the potential dangers involved in keeping such powerful animals, the cage must be built so it can be safely accessed and easily cleaned. Generally, this means front-opening cages or room-sized enclosures. Place a heat lamp or radiant heat panel at one end of the enclosure to provide a basking spot of 90 to 95 degrees Fahrenheit; placing the lamp at one end of the enclosure establishes a range of temperatures for the snake to use. Besides the basking spot, anacondas need ambient temperatures in the high 70s to low 80s during the day and night. If you must apply supplemental heat to raise ambient temperatures, do so with heat tape, heat pads or low-wattage basking lights. Always check ambient and basking temperatures regularly with a high-quality digital thermometer. Realize that cages of this size can be prohibitively expensive to heat, particularly for those living in cool climates. Anacondas require a high relative humidity, but the requisite large water bowl is usually sufficient to keep the snakes comfortable. If you're in doubt, provide the snake with a hide box filled with damp substrate. Very young animals can be briefly housed in 40- to 50-gallon aquariums or similar sized commercial cages. Keep 4- to 6-foot-long animals in cages with about 8-square feet of space. After this, it makes most sense to provide the animals with a cage large enough to house their full size. Yellow anacondas and male green anacondas require about 25 square feet of space; female green anacondas need room-sized enclosures of at least 50- to 100-square feet. Anacondas require water bowls large enough that they can lie submerged in a flat coil inside it. Additionally, you must clean the water frequently -- it's advisable to use a container with a drain hole in the bottom. Like most pet snakes, anacondas require at least one hide box. Suitably sized hiding boxes are not commercially available; you must construct your own. Anacondas like to perch on branches overhanging the water and should be provided with climbing branches. A branch of appropriate size for an anaconda is about the same diameter or larger than the snake; accordingly, it will be incredibly heavy. Attaching the branch to the walls of the cage requires sturdy hardware that must hold not only the branch, but the snake.